Here’s another gem from the Alien Planetscapes archives. These recordings date back to 1984-85 and were released by Arnold Mathes as two 1985 cassette albums: Gleepsite and Target: Earth. The backstory is that AP ship commander Doug “Dr Synth” Walker heard Mathes’ music on the radio and wrote to him asking if he would be interested in recording. Some of tracks are Walker-Mathes duo recordings with Walker on synths, sequencers, flute, gliss guitar, tapes and effects, and Mathes on synths, digital sampler, drum machine, tapes and effects. Others includes James Levine (who I’d not heard of before) on synth, drum machine, tapes and effects and John Likides on guitar, guitar synthesizer and effects. Much of the music is characteristic of the duo recordings Walker was doing in this period with various electronic artists, but some foresees the bigger band music that AP would more fully explore in subsequent years. Some tracks feature a mixture of electronic space symphonic Progressive Rock and early Tangerine Dream/Klaus Schulze, with intense cosmic orchestrations colored by oodles of bleeping and soaring electronic effects. We’ve also got space excursions with multiple layers of soundscape, drone and percussive patterns, including various synth fun, atmospherics and effects. This is music that flows continuously but couldn’t be further from meditative floating space electronica. There’s so much happening and so much to digest that it begs the listener’s undivided attention. There are synth jams scattered throughout that invoke Sun Ra, which is no surprise given Doug’s passion for Free-Jazz. I like the quirky, Casio-like percussion on Systems Activated, which lays the foundation for what sounds like a Jerry Goodman Mahavishnu Orchestra violin solo, all within a deep space exploratory context. I like the contrast between the repetitive pounding singular drum beats, melodic trippy synth melody, soaring synth lines and effects. And the spirit of Free-Jazz continues in some of the frenzied, high intensity synth and effects mania pieces. Two of the standout tracks are the ones that feature prominent guitar from Likides. Ghostship is a free-wheeling glom of whirring oscillations and effects, howling atmospherics, and streams of varied guitar soloing, some of which remind me of Roger Trigeaux’s work with Present, some that strays into Derek Bailey territory, and some is just rip it up rocking. It’s very intense and filmic in its noisy, spaced out and creatively chaotic way. Ritual includes Robert Fripp styled guitar (among other variations Likides cranks out), which sounds pretty cool alongside all the whimsical percussive clatter, zig-zagging electronic effects and cauldron of synths. And the nearly 20 minute Target: Earth is like a synthesis of everything that came before, being a glom of image inducing symphonic space electronics, thematic orchestral Progressive Rock, spaced out electronic Free-Jazz, 80s New Wave, soundscapes, drones and effects GALORE. 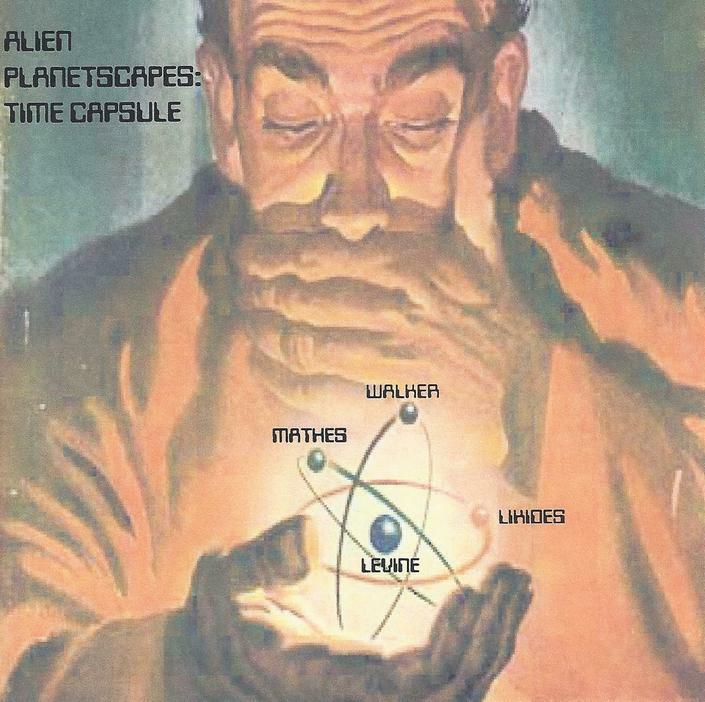 I never tire of these Alien Planetscapes recordings that people continue to reissue. Keep ’em coming!